But wait, where’s Virtual Link? 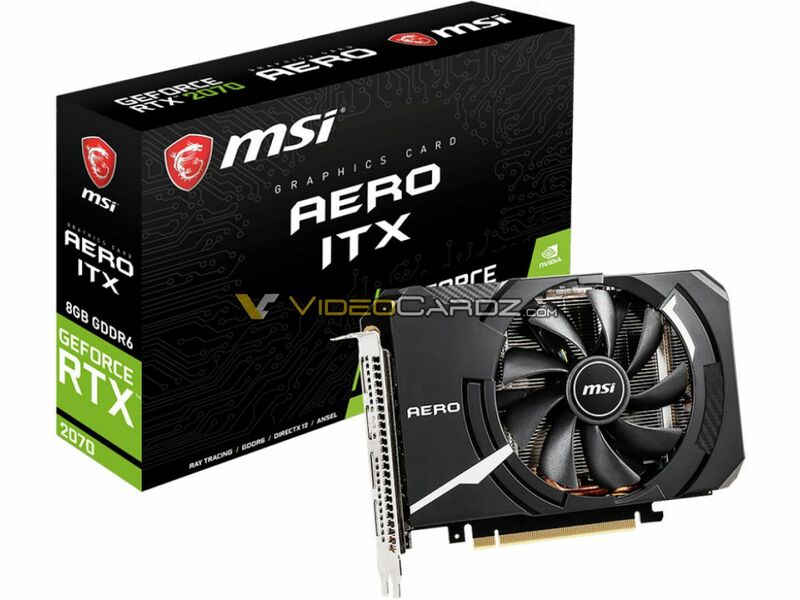 AERO ITX based on GeForce RTX 2070 is MSI’s smallest graphics card from 20 series. In fact, this is the smallest card with Tensor and RT cores on the market, which is quite an achievement, I guess. The RTX 2070 AERO ITX is missing two things: NVLink connector (obviously, but this leaves more space for other components), and VirtualLink. GeForce RTX 2070 cards have a variety of display connectors, for instance, Founders Edition cards ship with DVI connector, while 80% of RTX 2070 cards do not. The Aero is an exception, because not only does it not have DVI, it also does not have USB TypeC connector (unless it’s hidden somewhere, but I can’t see it?). The packaging suggests that AERO ITX is not factory-overclocked, so the single fan has to deal with 175W of power (in most cases).